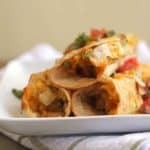 Mexican Breakfast Flautas – perfect for Lent, these meatless flautas are one the best Mexican breakfast recipes ever! Disclosure: I was compensated by Safest Choice for this post but all opinions expressed here are my own. 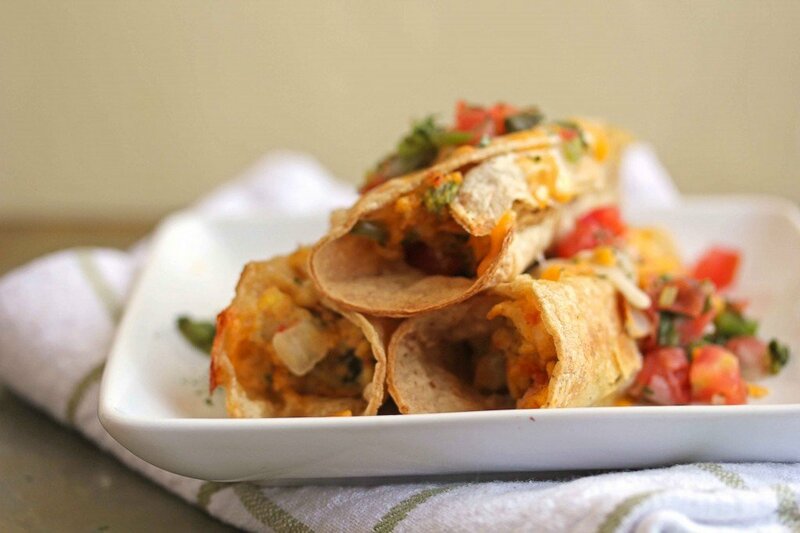 I am excited to share these Meatless Mexican Breakfast Flautas for Safest Choice Eggs’ March Meatless Meals Party today. 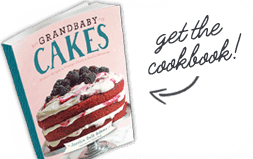 This recipe is really a deviation from my childhood traditions. I grew up eating a lot of meat. Each meal had a different meat star ranging from chicken to beef and sometimes venison for special occasions. Even our vegetables and side dishes like collard greens, string beans and peas had meat in them! How can you have black-eyed peas without turkey, or in some cases, ham hock? I am truly a product of that upbringing. However, as I got older, I started to rely a lot on meatless meals. I stopped eating pork and most beef years ago. I also eat (and love) vegetarian dishes I never thought I would ever eat. From curry chickpeas over rice to butternut squash ravioli and spaghetti and lentil meatballs, I have learned to enjoy and even crave some vegetarian meals more than their meat counterparts. 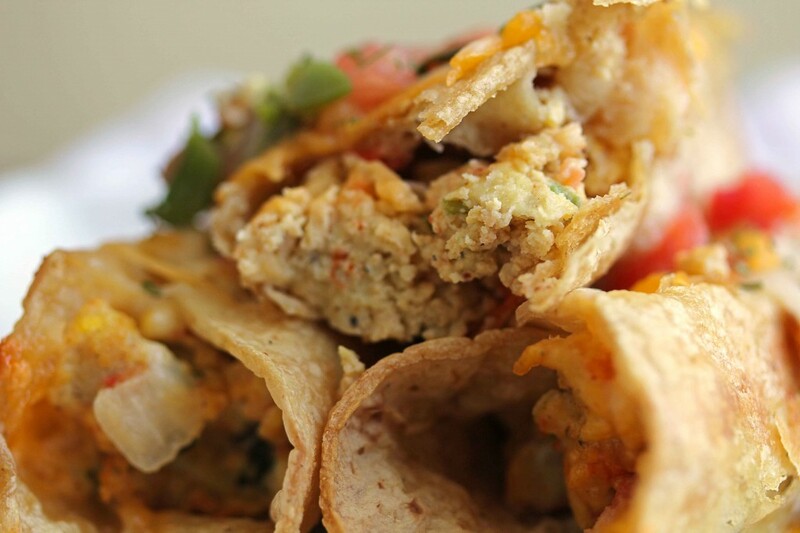 That’s why this breakfast flautas recipe with eggs wasn’t much of a stretch. A flauta is a fried Mexican dish comprised of a rolled up tortilla (usually corn tortilla) filled with meat and cheese. For my breakfast flauta recipe, I have decided to not use meat (pork, beef, chicken, etc.) and use eggs only. 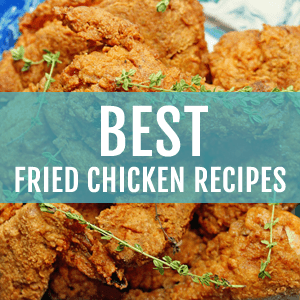 Also, this recipe does not require frying the tortilla. With just four eggs left in my refrigerator one morning last week, I started brainstorming of a way to create a fun, easy and meatless breakfast using those few resources. With a couple more additions of classic Mexican flavors in pico de gallo, taco seasoning with chili powder, paprika and cumin, and a few corn tortillas, this Mexican breakfast recipe idea came into being. I scrambled the eggs with pico de gallo and Mexican taco seasoning. Next, I scooped some of the egg mixture onto a few tortillas, topped with a Mexican shredded cheese blend and rolled them up. After adding a little olive oil non-stick cooking spray to the tortillas, I baked them for 15 minutes on high heat until the tortillas were crispy, golden brown and delicious. After eating one (well maybe I had more than just one), I realized how easy it is to create incredible and memorable dishes without meat where eggs are the star. I didn’t miss the meat one bit and neither will you. Try this easy breakfast recipe and enjoy a few meatless alternatives for a change. You won’t regret it. I certainly didn’t. Mexican Breakfast Flautas - perfect for Lent, these meatless flautas are one the best Mexican breakfast recipes ever! In a small sized bowl, whisk together eggs, water or milk, taco seasoning and salt and pepper. Over medium heat, add in canola oil and butter to a skillet and melt together. Next add egg mixture and pico de gallo to skillet and stir eggs to scramble until set. When eggs are scrambled, spoon egg mixture down the center of each tortilla and sprinkle with cheese. Tightly roll each tortilla and carefully place open side down on a small baking pan. Spray tortillas with non-stick cooking spray. 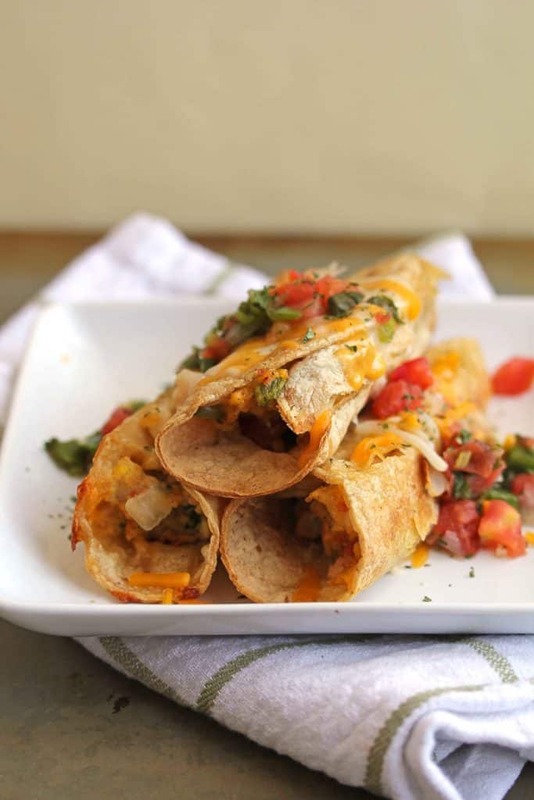 Bake flautas for 15-17 minutes or until tortillas are crispy, set and golden brown and serve. Optional: Sprinkle additional cheese and pico de gallo over tops of flautas for garnish. 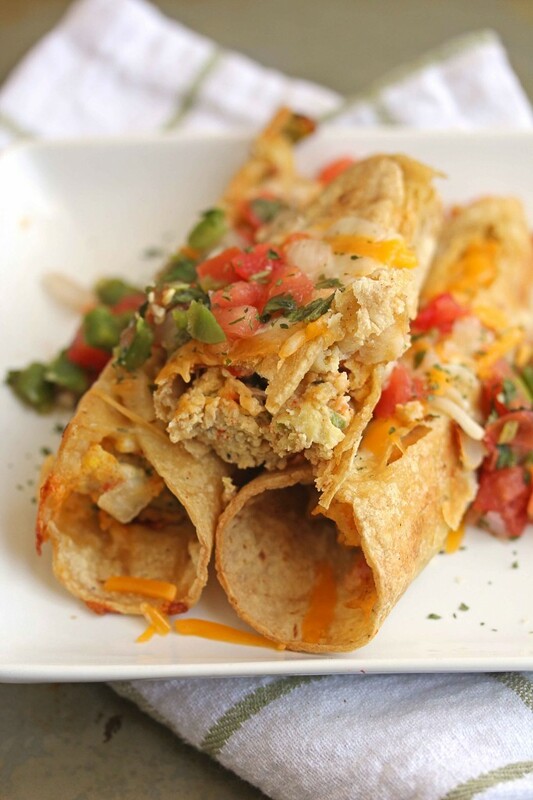 Licking my chops at these breakfast flautas! Looks like I might need to change my plans for the morning. Yep, I think I might have to as well! Now I want these!! I often use Beefless beef from TraderJoes for my tacos, enchiladas etc, These are a yummy, change for breakfast. These look so, so, so good! I am burnt out on sweet breakfasts and this look likes the perfect solution. Can’t wait to try them! Great Allison! I am a little burnt on sweet breakfasts myself. Let me know how they turn out for you! I have a skinny crusltess quiche I like to make, it is delicious! 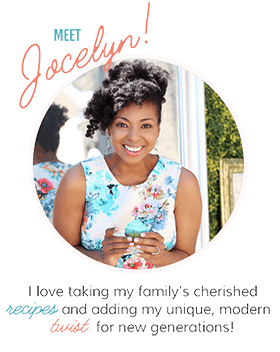 You’re inspiring me to be more creative with breakfast, Jocelyn! These look amazing! Thanks Julie for stopping by! Same here! I am a big fan of Mexican food. I have this restaurant I go to a bit too regularly now. I loooove Mexican food any time of day! I also appreciate a good baked flauta! I used to be a vegetarian in high school then I went meat crazy post college nooooow I am back to eating mostly meatless and I love the variety! That sounds awesome! I definitely need to do more switching up my meals because I love variety as well! Oooo the flavors! These looks amazing Jocelyn! Hooray! Exactly it really does say something when Meatless Monday gets you excited!! Ha I know that. Meatless meals don’t exist in my family’s homes either haha. I’m all about chickpeas as a healthy vegetarian meal – my mom used to make them a lot growing up Indian-style and they are so good! I usually go sweet for breakfast but this is great! I go sweet for breakfast too and now I am starting to do a bit of both!! Hello, Jocelyn! I really do enjoy vegetarian dishes and only used to eat meat once a week or so, but I have to admit it’s a little harder now I’m married to a meat-lover! I’ll have to try and come up with some dishes where you don’t miss the meat … just like this one! Eggs are wonderful and especially when made so creatively into something yummy like this! Thanks so much Helen! I totally understand the struggle to make more vegetarian meals with a meat eaten husband around. I have the same issue lol. 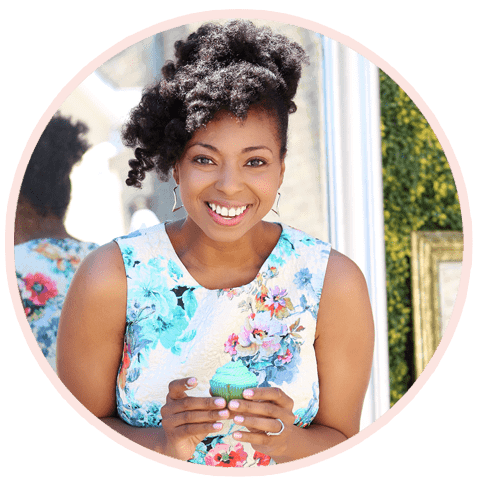 Jocelyn, these do look amazing – I love spicy breakfast egg dishes! Same here, I adore spicy eggs! Thanks Donalyn! Yes you will love it! And its super simple and fast to make too! These look like a great breakfast! Thanks so much Chloe!!! They most certainly are! Breakfast is my favorite meal, especially breakfast burritos! So I think I would be in heaven with these! Breakfast burritos are now my favorite thing too Julianne! Ooh these look like a great weekend breakfast! Question: why do you add water to the eggs? Thanks! Hi Sasha, thanks so much! I usually add water or cream to my eggs when I scramble them out of practice. It just gives it a great consistency. But you are welcome to omit if you prefer yours without the additional liquid. I think my favorite thing to make would be an egg bake (egg strata). I am such a huge lover of all breakfast foods so it is hard to choose. Ohhh I love strata. I am a big lover of breakfast foods too so I adore all of them! These look delicious! What a creative way to make eggs! I think my favorite thing to make with Safest Choice Eggs would have to be fritattas! I adore making frittatas with their eggs too Cate!! I’ve been meaning to make breakfast burritos or something of the sort. Love these. Breakfast burritos are the perfect vehicle for a morning meal. Thanks Erin! I love, love, love flautas! Breakfast flautas?! I’m totally sold. 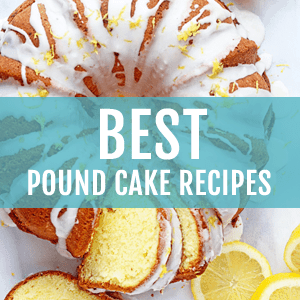 They look delicious and I can’t wait to whip up a batch! Pinned! Thanks so much Justine!! Aren’t flautas so yummy? This looks really good!! Totally love anything mexican inspired and this falls nothing short of that! Pinning this to make soon. Thanks for sharing 🙂 Happy St. Patty’s Day! Absolutely and I adore Mexican inspired dishes too. Such great flavor!!! Happy St. Patty’s Day to you as well! Yum! I love Mexican-inspired dishes, and these breakfast flautas would be the best way to start the day, hands down! I eat a lot of eggs, too. I have a hard-boiled one at lunch nearly every single day. I never tire of them! Oh gosh I adore hard boiled eggs. I would never tire of having them everyday either! Oh I love these Jocelyn!!! So many favorite egg dishes for meatless meals: frittatas, scrambled eggs, poached eggs. I’m not picky, and I only use Safest Choice Eggs – they’re the best! Agreed Laura! Safest Choice is the best! yum! I feel the same way.. trying to eat less meat as I get older. I think quiche can also be a great option for a meatless meal with eggs! Quiche is so fantastic!!! I must feature one on the blog soon. It is a healthy breakfast. Great so happy to share!! I love a great vegetarian meal, Jocelyn, and these look absolute delicious! I wouldn’t miss the meat at all…they look so hearty and satisfying. Thanks so much Marcie! I totally didn’t miss the meat one bit. I make breakfast burritos from time to time, but oddly enough I’ve never thought of adding salsa to my eggs. These looks amazing! Yes I totally make breakfast burritos as well and I adore adding salsa to my eggs for a little kick and update. I would make a meatless Spanish tortilla… love them! Gosh I need to try a spanish tortilla!! Nice! They look really delicious Jocelyn.